Why did the U.S. Military Academy invite a Communist Party member who made his billions selling counterfeit goods? 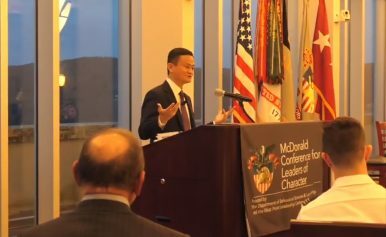 Jack Ma, founder of Alibaba, owner of the South China Morning Post, and a Chinese Communist Party member, was invited this past week to speak on leadership to the cadets at the United States Military Academy, commonly known as West Point, in the United States. West Point is an august American institution of higher learning that selects a diverse group of young Americans each year to train for the highest roles in the United States Army. These young people go on to serve in key positions defending the country and the constitution from enemies. Why would West Point ask a Chinese billionaire, who is incidentally a member of the Chinese Communist Party (CCP), to speak to exceptional young future leaders of the American military? Jack Ma, whose real name is Ma Yun, has, like Ren Zhengfei, founder of Huawei, a seemingly romantic, rags-to-riches story reminiscent of the American dream — think Horatio Alger stories. The story goes something like this: It is the late 1990s. An idea occurs to Ma, and inspiration sets in. A trip to America confirms a rumor: the internet exists. Back in China, on a scratchy dial-up access line, he hits pay dirt: Chinese, too, can get onto this worldwide web, so essential to his innovative idea to connect Chinese suppliers with customers all over the world. Working in Hangzhou, inevitably from a cold-water flat, with no heat in winter, Jack and his small band of buddies begin to build an online marketplace that solves a problem for China’s new, generally small entrepreneurs: How to reach the world? How to be reached? It sounds like the American dream, with a Hollywood ending. Jack Ma seems to be nice guy. His leadership skills perfectly suited his time, his mission, and most of all his environment. In Ma’s world, an explosion of mostly farmers found that they could make things, from auto parts to buttons, from cheap electronics to very sophisticated ones, from toys to towels, that the rest of the world would buy. They had been given a jump start by foreign companies, many of them Asian, who turned to the cheap labor markets of China to produce things that they had previously been making in more expensive places like Taiwan and Hong Kong. Along with labor came knowledge, however, and soon domestic ventures, many of them housed in the homes of their owners, with workers living on one floor, production on another, and family quarters on yet a third, were making the very products that the foreign companies had originally contracted at cut-rate wages. Zhejiang province, where Ma is from, is littered with these domestic workshops. Yiwu, now the largest wholesale market on earth, is a 90-minute bullet train ride south of Hangzhou, the provincial capital where Alibaba’s campus and headquarters reside. The problem, however, was how to capture market share away from the original producers. Alibaba, and its domestic online retail shopping site, Taobao solved this problem, spectacularly. Today, Ma is reported to be worth $22 billion. There is however, one major fault in the system, one which Alibaba has taken steps to combat, but does not, according to Forbes, commit to eliminate. And therein lies the rub. When Alibaba went public in 2014, in what is still the largest Initial Public Offering (IPO) in U.S. history, of major concern to regulators and investors alike was that much of Alibaba’s fortune is made by helping to sell knock-off products, millions and millions of them. Ma himself, however, has seemed conflicted over cracking down on counterfeiters, and therein lies the inherent contradiction of not only his business model, but his outlook on the rule of law. To millions of Chinese, and others, unconcerned with intellectual property laws, especially those that protect expensive designer brands, Jack Ma is a hero. Very recently, Ma has changed his tune a bit, even calling for some counterfeiters to go to jail. But, as recently as last year, Taobao was still on the blacklist of the Office of the U.S. Trade Representative for not doing enough to stamp out the counterfeit trade by which it profits. So the question remains, why do West Point cadets, who earned their places in one of the world’s most prestigious institutions largely through their character, need to hear about leadership and character from a man who got rich by flouting the law, and empowering others who do? Will Alibaba Be the First Chinese Company Punished by Trump? Trump reveals that a very big fine will come out soon over Chinese intellectual property theft .